Youth leaders from the Brighton Park Neighborhood Council (BPNC) and community residents of Brighton Park and Back of the Yards, both communities in the 15th ward, convened inside the Gage Park Fieldhouse, 2415 W. 55th St., on Monday to challenge Alderman Lopez on why he recently recanted his support for amendments to the carve outs of the City of Chicago’s welcoming cities ordinance. Alderman Lopez was one of the co-sponsors of the Welcoming Cities ordinance introduced in City Council chambers February 22nd, 2017. The ordinance which had 28 co-sponsors when introduced, has stalled in committee for the past five months. Lopez, whose ward encompasses Brighton Park, Gage Park, Back of the Yards and West Englewood had been a supporter of the ordinance until last week when he declared at a public meeting hosted by Brighton Park Neighborhood Council that he no longer supports the amendments to the ordinance without giving a clear answer as to why he decided to renege on his support. In addition, Ald. 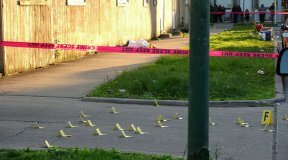 Lopez, whose ward has seen a staggering amount of shootings in the past year, has blamed the violence in his ward to “gangbangers” and those who are too afraid to come forth and report illegal activities in the ward without ever discussing the lack of opportunities and resources for youth in his ward. Ald. Lopez has pointed to programs like One Summer Chicago, as one of the many programs he has brought to the ward but this program is sponsored by Mayor’s office and it was already in existence in Brighton Park and Back of the Yards prior to the Alderman getting elected in 2015. 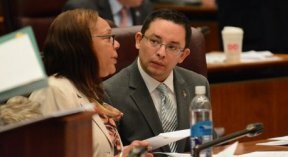 In addition, Lopez along Alderman Burke, introduced an ordinance last week to further criminalize people in his ward by suggesting parents who fail to turn their children into the authorities, if they have possession of an illegal weapon, should be cited by the police and be subject to family counseling among other things. BPNC youth leaders and residents demanded that Alderman Lopez stop marginalizing families. Instead, he should stand up for immigrants in his ward and bring money for violence prevention programs in the 15th ward, stated a youth member of BPNC.